Pin Terminal Blocks are manufactured from nylon, polyamide, polymer, brass, nickle plated brass, copper, aluminium or any material composition as per custom specification. We manufacture and export wide variety of Pin Terminal Blocks including Crimp Type Pin Terminal Blocks, Bi-Metallic Pin Terminal Blocks, Insulated Pin Terminal Blocks, Uninsulated Pin Terminal Blocks and Pre-Insulated Pin Terminal Blocks. Pin Terminal Blocks assure proper electrical contact and a stronger connection. 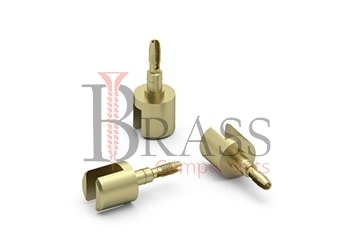 Pin Terminal Blocks are available with Chrome, Brass, Nickle Plated Brass, Zinc, Electrolyte Tin, Copper or any other type of coating or plating as per custom specification. Available in Straight, Modular, Side Stackable and other configuration. Corrosion Resistant and Abrasion Resistant. Available with Chamfered barrel entry. Compliant with RoHS and REACH directives. Eliminate installation and operational issues. Offer Quick and Easy Connection and disconnection in varied applications. Provide reliable, durable and vibration proof connection. Compatible with all popular pin type terminal wires or terminal blocks. Allow multiple wires to be inserted into terminal Blocks. Widely used in installation of interconnecting controller. Designed to be crimped to reduce conductor size for termination into contact blocks. Can be used or clamped repeatedly without damaging the pin. Ideal for used in Electronic, Chemical, Automotive, Automobile, Telecommunication and other industries. We manufacture Pin Terminal Blocks as per Custom Specification and export in Germany, Spain, Netherlands, Portugal, UK and other European Countries. For more Information, Please Contact Us or Inquiry Now.